Time for European action on climate change, not for words! According to Mr Petit, we face a threatening paradox, where ACP countries are the ones most affected by climate change; they are also the least equipped to fight it. Sadly, this could mean that all our efforts to achieve the MDGs could be dried out or washed away by the effects of climate change. 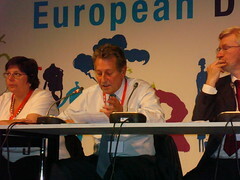 In this scenario, Bernard Petit indicated two main directions for the EU response. First, adaptation strategies need to be addressed and included in the EU-Africa partnership, and European and African leaders need to agree on concrete actions to address climate change effects. Second, recognizing that climate change is not about North/South but affects us all, we need a more political approach to climate change. The EU is therefore working to establish a global alliance on climate change, involving the less developed countries, especially island states, and creating a platform for political dialogue that advances a shared vision on how to overcome the challenges posed by climate change. In particular, the proposed global alliance is looking at some specific actions, such as backing up existing adaptation programmes, cutting carbon emissions, reducing the risk of catastrophes; and mainstreaming climate change in development strategies in general. All of this is easy to say; much more difficult is actually doing it! What it is certain is that the EU has to take greater responsibility in working with the countries most exposed to the effects of climate change.